"Mary Ellen had managed the group practice I was with for almost 12 years. When she left to start her own billing company, our group made the disastrous decision to use our accounting firms medical billing company. Their certified coders knew nothing about neurosurgery and our billing quickly became a Compliance nightmare. IPC Billing helped straighten out my billing mess and I have been their loyal customer for over a decade." Innovative Practice Concepts, LLC is a medical billing company offering full revenue cycle services  demographic and charge entry, claims transmission/billing, remittance posting, insurance follow-up, denial management, patient statements and pre-collection services. Client satisfaction and personalized service are emphasized throughout our organization. Our employees are experienced, highly motivated and dedicated to providing excellent service to both providers and their patients. They offer consistent quality and tenacious claims follow-up to ensure that you receive all revenue due. Innovative Practice Concepts LLC was founded 13 years ago by two highly experienced medical managers who each brought their individual knowledge and skills to the firm.  Patricia J. Nevala, MS, MBA, FACMPE, is a former medical practice administrator with more than 30 years of health care management experience.  Mary Ellen Duffy, MBA, FACMPE is a former CEO of a billing and consulting firm who has presented seminars on billing and financial management to physician practice organizations. Both Nevala and Duffy are active in the Healthcare Management and Billing Association and have achieved "Fellow" status in the American College of Medical Practice Executives' certification program. Currently, there are only about 500 Fellows in the Medical Group Management Association, a national organization made up of 27,000 medical practice executives. Why do IPC clients consider us unique? Unlike other billing companies who may be impersonal and unresponsive to your needs, IPC functions as your practices "back office." Our employees work as a team with your employees. We act as a resource to both you and your staff. Calls will be answered by a live person from our office, not an automated attendant or someone off-shore. We make every effort to answer questions immediately. And when it comes to dealing with insurance carriers, we "have your back." Our clients have entrusted their financial well-being to us and we take that responsibility very seriously. Our goal is to generate "clean" and compliant claims. To help achieve this, we standardize our internal processes and use a claims-scrubber feature in our software. 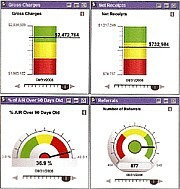  cutting edge dashboard analytics which allow you to easily monitor your practices financial performance at a glance. With our software, you choose the real-time performance indicators that matter to your practice and the information is displayed as interactive tables, charts, graphs and/or gauges on your dashboard. All displays include "drill-down" functionality which enables you to see actual patients and line items included in the measure. In addition, our software can interface with your EMR system to allow seamless integration of clinical and billing information.